Dates of birth and death unknown. Disciple of the tachiyaku actor Kamakura Dan'emon, his first stage appearance was recorded in the 11th lunar month of 1694 at the Ichimuraza, where he performed as an oyajigata. He went to Ôsaka in Fall 1711 and played the role of Takamatsu Sendayû in the kaomise drama "Futabashira Aioi Chôja", which was coproduced by Ogino Yaegiri I and Miyazaki Denkichi. He stayed in Ôsaka for a while, retired from the Kabuki world and went back to Edo, where he died the 21st day of the 11th lunar month of 1718. He was the father of Ichikawa Danshirô II and Kamakura Chôkurô II. He was also the master of Kamakura Heikurô I, whom he met when he performed in Ôsaka. The actor Kamakura Chôkurô II held this name from the 1st lunar month of 1721 to the 12th lunar month of 1722, then from the 11th lunar month of 1723 to 1739 (?). Dates of birth and death unknown. His first stage name was Sawamura Imazô (unknown relationship to the Sawamura clan). He took the name of Kamakura Chôkurô III around 1773. No more record after 1774. 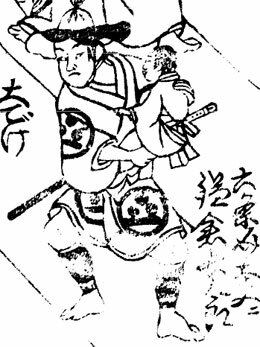 He was a minor katakiyaku actor and his ranking in the 1774 Edo hyôbanki was jô-(shiro)jô (superior - (white) superior). His haimyô was Ryûsha.